Josh Fogel, out of the kindness of his heart, sent me an amazing treasure yesterday. He is translating the massive Leksikon fun der nayer yidisher literatur - it's a side project, he says, "a labor of love and hopefully of use to younger scholars coming up in that field ... I'm always looking out for any details I can add to the bios--dates, correct titles, etc. When I came to your guy, I googled him and found your website." Josh's translation is at his wonderful blog, Yiddish lexicon: YITSKHOK ZHELONEK (ICEK ZIELONEK) - to paraphrase, Zhelonek was born in 1902 in Warsaw to a laboring family. He was a reciter of poetry and a modern wedding entertainer [one of the booklets I've got is called Der moderner badkhn]. He published humorous poetry. Nothing was heard of him after World War II. 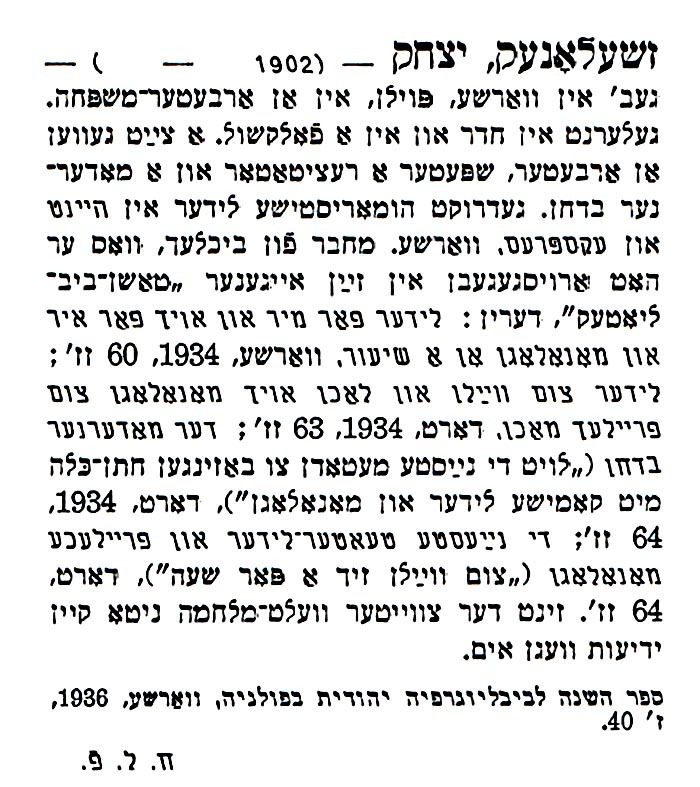 The information was taken from Sefer hashana lebibliyografya yehudit bepolanya (Annual of Yiddish bibliography in Poland) (Warsaw, 1936), p. 40.